You have to start making changes in order to see and feel a difference in your body! 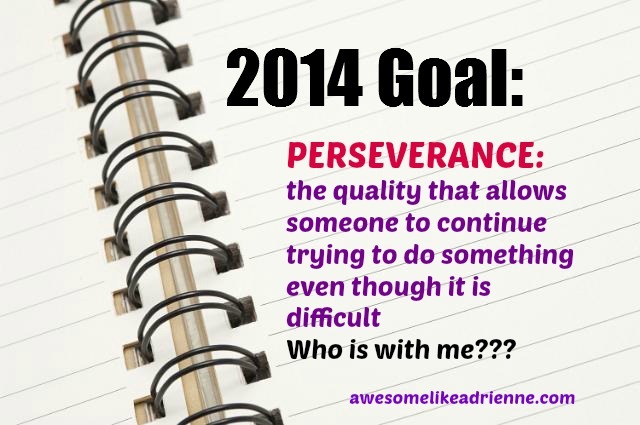 Print this out and stick it on your fridge, in your planner or at your desk. Just use it as a reminder that you just have to start! Take it one day at a time, one week at a time, one month at a time…Start doing more of these things and less of the others and your body will change! IT WILL WORK IF YOU STICK TO IT! …….speaking of that (read below)…..Who is with me? Hello!! Tonight I really want to write from my heart as I feel this is something all men and women need to hear…..
Last week I somehow got into a Facebook conversation with someone whom I have never met in person about me, my page, my training, career, food etc. He said that I was “Average and not exactly Miss Fitness looking” so he was wanting me to “kick up my game a notch so that I would actually be inspiring, look the part, do the work and then post pictures of smoothies”. In my mind this is his picture of “perfect’ which then makes me “average”. I explained to him that I have different goals. My goals include eating healthy foods, moving my body in all different ways (weights, cardio, whatever) life balance, happiness, being a good mom, daughter, girlfriend, sister, friend and overall good person. I like to cook, I like to be creative, I like to have fun and I like to share that information with anyone that it might help in the tiniest of ways. My goals are different from those of these women. My goals do not include a # on the scale or a certain % of body fat. I thought about it some more and thought if she is perfect and I am average then I actually think average is pretty darn awesome! I live a healthy life full of balance, trying new things, helping others, not worrying about living up to a standard of girls on magazine covers, learning to love and appreciate my body and encouraging others to build muscle because it makes you happier, healthier & stronger both physically and mentally! My job is to be a personal trainer. My job isn’t to look perfect or be the strongest or leanest or anything”est”. My job is to help people, encourage people, teach them about exercise and food and how they can change their body. My job is to support, inspire and make it fun! If your goal is to compete or look that way then I have NO Problem with it but there is another set of woman who are trying hard just to lose weight, maintain their fitness, gain mental strength, find happiness, balance, love, direction, inspiration and peace. I am interested in that and if being good at ALL of those things makes me “Average” then I am all about it!! I am a regular/normal gal and I do not need to be anything but that. I chose everyday to be happy & awesome, to do little extraordinary things that may or may not reflect in a picture of me. What really makes me sad though is thinking about women everywhere that are thinking they have to live up to this perfect woman standard. Guess what?! No matter how hard I try….I will never be taller than 5′.2″, I will always have a booty, a smaller chest, a tremendous get out of bed and look fabulous head of hair, sparkly hazel eyes, a great attitude, love for all and an inspiring full of energy spirit! I like that! I am happy with that! I like being perfectly “average”! I am not insulted or angry with this conversation we had (in fact this subject matter has been on my mind for a long time) but I would like to use it to show an example of what it is like to be human and how we are all different. It is ok to look and feel different and no one should ever be compared to anyone else. We are human therefore we are unique! We all have something to offer. We all have a different point of view and they are all right because they are ours and we believe in them! I want women to realize that there are way more important things in the world that matter! It is not about what you look like. Being happy, your mental state of mind, is a goal-a broad one yes, but in my eyes the most important! 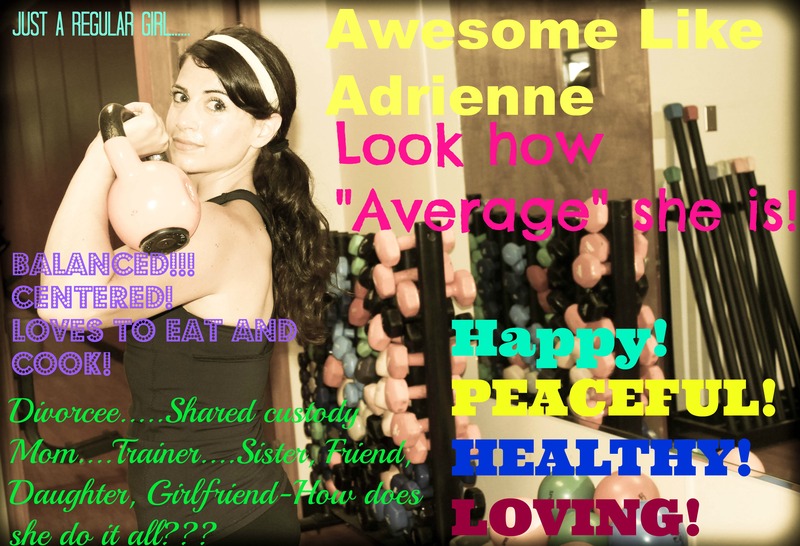 No one should ever tell you , “why can’t you be more like her?” So my advice, as a personal trainer, is get happy by getting fit and healthy, start to move your body and eat real food and what you look like will be Awesome and if you are lucky maybe even “Average”!!! This is me and I am awesome! You should be telling yourself the same thing every single day no matter where you are on your fitness journey & no matter what your story is!! What would your “cover” say??? Where to even begin with this!?!?! Do you want to eat something delicious that is good for your muscles, hair, eyes, nails, skin, heart and brain??? Well here you go you “health nut”! A special mix I made to say Merry Christmas and thank you to my training clients and people who take my classes at the gym! Place in large bowl, mix gently with a spoon and scoop out 1/4 c servings into baggies or keep altogether and grab as needed. Tips: I find that when I portion out ahead in 1/4 c baggies that really helps. 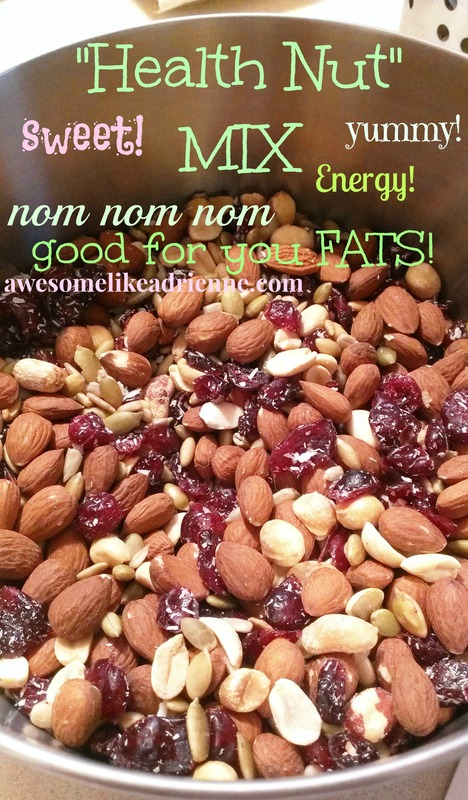 As you may or may not know seeds and nuts are high in calories and fat (good fat) and should be consumed about once a day-a handful or so. I usually keep some sort of nut/seed mix in my bag as emergency food and it also makes for a great pre or after workout boost! Take it hiking, take it on road trips in the car or plane…just make it and take it! So friends….. enjoy, be inspired, take charge, have pride in your health, plan ahead, don’t get caught hungry and put something good in your body that will reflect well on the outside! In this case, be careful if eaten every day your hair may shine, your skin may glow, you may become extremely productive and even see more clearly!! You want 1 part oil to 2 parts sugar (Brown or White). You can use any kind of oil: Canola, olive, coconut even baby. Then add a few tsps.. or drops of scented oils, vanilla or almond extract, citrus juice like lemon, grapefruit or orange. Lastly, totally optional, you can add a dash or two of: honey, cinnamon, ginger etc. to give it color and scent! Stir gently and well then add to jars. 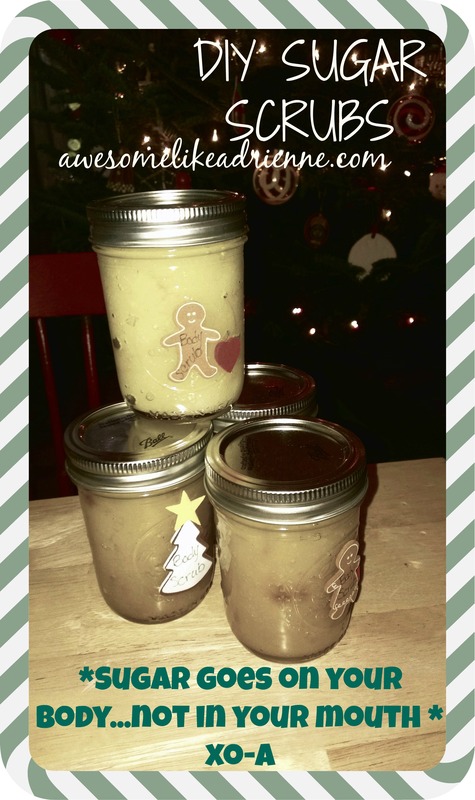 Jars were purchased at Giant Eagle and I had the little gingerbread people and trees at home in my craft box. So easy, very economical and remember better to give sugar that can be used to beautify your skin instead of wrecking it!!! 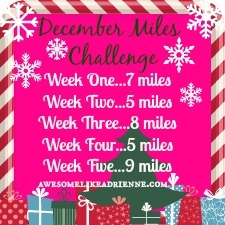 I am challenging you this month to get some miles in, 34 to be exact!!! Follow the chart above to achieve your total or please by all means feel free to blow the goal out of the water! It is recommended that we get 20 to 60 min of cardio about 3 to 5 times per week. 30 to 45 min each time is a great goal! Running, walking, jogging, biking, rowing, swimming, spinning, arc trainer, elliptical trainer and treadmill. I love interval training. This means you would start at a moderate pace and then spike up the speed or rate for small amounts of time. Then slow back down to a moderate pace for a few then kick it back up making the exercise more intense. You can do interval training on any of these machines or walk/jog/run around your track or neighborhood. This type of training consistently jump-starts your metabolism! Ahhhh…yes please! Enjoy this challenge and make sure you are drinking your water and eating your lean proteins, good fats and clean carbs!!! This will get you the best results!